India is a country with a diverse culture, a rich and ancient history and drastic geographical variations. Every state, and sometimes every region within that state, has its own unique culture and heritage. This is reflected not just in their food and customs but also in their textiles, handicrafts, arts and embroidery styles. This is why India has become such a never-ending source of inspiration for international designers and why Indian designers never run out of beautiful ethnic crafts to feature in their collections. One such region that has been immensely lauded of late for its gorgeous and unique textiles is Kashmir; arguably its biggest ethnic export is the Kashmiri shawl. 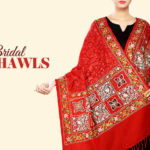 Kashmiri shawls are one of the most luxurious and attractive shawls in the world. They are much loved and coveted for their fine appearance and intricate designs, created using ancient regional techniques. 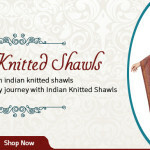 Another major attraction of the Kashmir shawl is that it is mostly made using very fine materials which are distinguished not only by their super-fine look, soft texture and lustrous glow but also by the quality of the raw materials used to make them. In Kashmir, shawls are usually made using wool from special sheep and silk from the finest sources which ensure that they are both sophisticated yet uniquely Indian. The beauty and value of fine Kashmiri shawls have been recognized by textile experts around the world and consequently, they are one of the most popular winter accessories for men and women. It is a type of woven wool material that has an incredible depth and beautifully takes on vibrant hues; moreover, despite being warm and wool based, Pashmina is extremely light weight and silky. The combination of beauty and comfort it offers is, in fact, its main attraction, along with the immense brand value it has in today’s globalized world. In India, having a pure Kashmiri pashmina shawl is a sign of status and wealth, even when it is simply a plain shawl in a simple color. There are many different types of Kashmiri shawls available in the market. They can vary in terms of the quality of the fabric or the designs done on them. The purest Pashmina shawls are obviously more costly because of the high-quality fabrics used to make them. 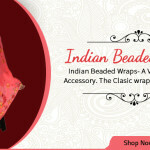 Low-cost varieties of Kashmir pashmina shawls are also available nowadays. These are more affordable and hence can be purchased in larger quantities, or for more casual occasions. One can also get simple shawls made with wool or silk which are also very beautiful and can be worn for more semi-formal occasions. In terms of designs, embroidery is the most frequently featured art form in these shawls. 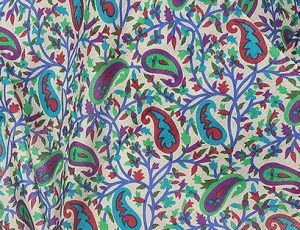 The traditional design on Kashmiri embroidered shawls was that of a cone shaped motif repeated throughout, but today a lot more varieties are available. The designs can range from simple flower patterns to elaborate nature-inspired motifs and artistically drawn figures and shapes. 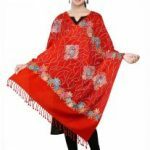 Kashmiri embroidery shawls are distinguished not only by their beautiful patterns but also by the use of bright, colorful threads of a large diameter. These are often prominently displayed on lighter color fabrics, creating a very pleasing aesthetic effect. Kashmiri shawls for men come in more muted shades and with sober designs and are used to accessorize formal outfits such as sherwanis, suits and dhoti-kurtas as well as more informal garments like shirts or kurta pajamas. Usually, the more richly embroidered shawls are kept for special occasions while the faux-fabric and plainer shawls are preferred for daily wear. 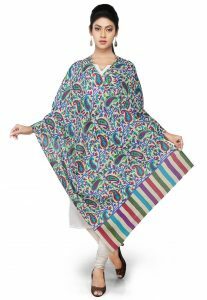 Kashmiri shawls for women come in a multitude of bright colors and beautiful designs. Even the plain ones usually have a fine shimmer and elegant look and can add an instant dash of class to any casual ethnic outfit such as a salwar kameez or kurti. 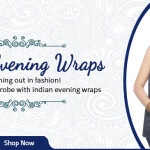 They are also a great winter accessory to pair with fancy sarees for weddings and other such occasions since they provide ample protection against the elements while also working as a gorgeous addition to the overall look.